KANSAS CITY, MO--(Marketwired - February 04, 2016) - Many winners in the 1,000 Win $1,000 Daily Sweepstakes H&R Block (NYSE: HRB), the world's largest consumer tax preparation company, is running until Feb. 15 are very familiar with the color green. It's part of their uniforms as members of the U.S. Army or Marines Corps. But, even those in uniforms of different colors have an appreciation for green -- especially the 80-plus military service members who are among the 16,000-plus winners of $1,000 at the midpoint of the month-long sweepstakes. With many of them filing their tax returns at an H&R Block office on base, from Alaska to Florida, and from California to Virginia, these winners are now enjoying a combined approximately $80,000 on top of their refunds. "H&R Block's commitment to serving those who serve our country goes back to the very founding of the company," said Kathy Collins, H&R Block's chief marketing officer. "Our co-founder, Henry Bloch, was a 1st lieutenant and navigator in the Army Air Forces during World War II. We are thrilled to give a little extra back to those who sacrifice so much for our country." There are more than 1.3 million active-duty personnel serving in the U.S. Armed Forces and it is one of the careers that demands the most from its members and its families. Being on active duty means they work full-time and can be deployed at any time, which can result in major life changes in an instant -- and that could impact their tax returns. "There are many unusual tax situations that arise when a family member is in the military," said Thomas Collins, head of corporate communications at H&R Block and a retired Army colonel. "For example, they need to know if they will be taxed based on state of residency. For those deployed, they need to know if they are entitled to a filing extension and if so, the deadline when they need to file. These are just a couple of the unique challenges facing members of the military when they file their tax returns." H&R Block prepares tax returns for approximately 1 in 4 active duty, active reserve and Department of Defense civilian employees and appreciates the rigors of their jobs. H&R Block not only is an expert at preparing tax returns for service members, but also provides support that positively impacts them and their families; in 2015, H&R Block contributed $1.7 million to Morale, Welfare, Recreation programs through the exchange commission program. Additionally, every year military spouses enroll in H&R Block's Income Tax Course as part of the spousal scholarship program. H&R Block also provides military members a 10-percent discount on bases for tax preparation and free online tax preparation through Military One Source. H&R Block operates 12,000 offices around the world and nearly 105 are on military installations with more being added. Military clients can be assured their tax returns are available anywhere in the world; if they return to the states, deploy to another international posting or they leave the service, their documents and records are available globally. H&R Block is giving away $1,000 to 1,000 winners for 32 days, for a total of $32 million. The first drawing for the sweepstakes was Jan. 16. Anyone who files their taxes in a participating H&R Block office by Feb. 15 can be automatically entered into the sweepstakes. This interactive map shows the states where the winners live. For more information, including official rules and other ways to enter, taxpayers can visit www.hrblock.com/grand, watch this video or join the conversation on social media and share how they would use an extra $1,000. Just use the hashtag #MyGrandPlan. For Official Rules and Alternate Method of Entry click here. Open to legal U.S. residents (50 states + DC & PR) age 18+. Entry Period: 1/4/16 - 2/15/16. One entry per taxpayer with paid federal tax return. Daily drawings 1/16/16 - 2/15/16 + final drawing on 2/19/16. 1,000 winners per drawing; 32,000 winners total. Total ARV: $32,000,000. Void where prohibited. 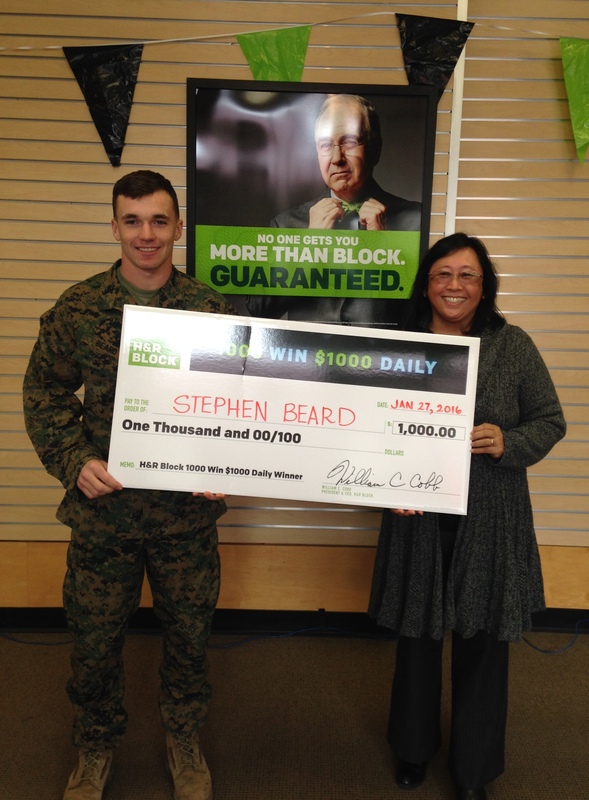 Stephen Beard (l), a local winner of the H&R Block 1,000 Win $1,000 Daily Sweepstakes, celebrates at the H&R Block office at Camp Pendleton as tax professional Maria Paz presents him with a giant check. Enter now through February 15.